Time: 7 hrs. 45 mins. 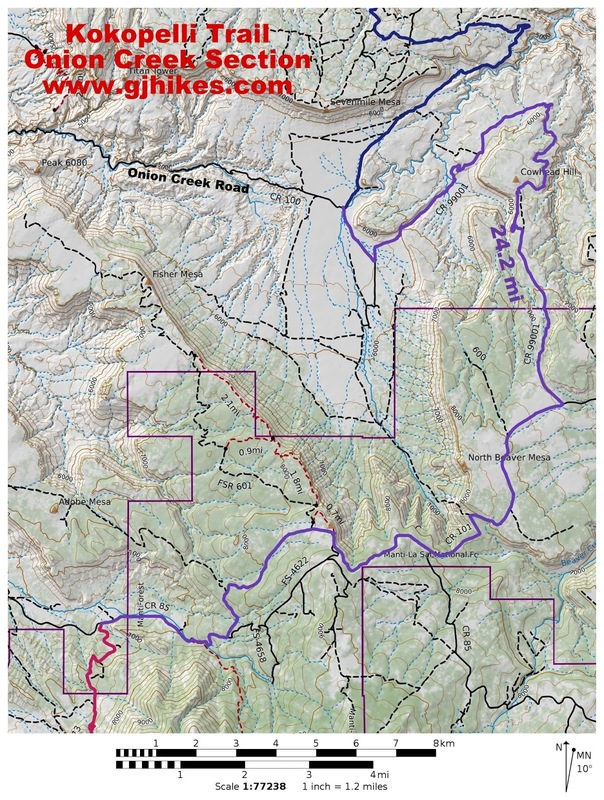 The Onion Creek Section of the Kokopelli trail stretches between the Onion Creek Road, in Fisher Valley, and the La Sal Mountain Loop Road, near Castle Valley. This section of the Kokopelli trail is 100% double track with the road varying between dirt 4x4, gravel and pavement. Going in this direction, from north to south, there is 4,760 feet of climbing elevation compared to 3,910 feet if going in the opposite direction. Even though there is more than 800 feet more elevation to gain going in this direction the average grade is slightly less. Most of the elevation gain going the opposite direction is on paved road so that might make up for the difference in grade or perhaps make it easier overall. This section of the Kokopelli trail begins 10 miles north of Highway 128 where the Rose Garden Safari Route meets the Onion Creek Road or where we left off after the Dewey Bridge Section of the trail. 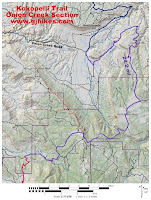 After following the road for 1 mile the Kokopelli trail branches off on the left towards North Beaver Mesa and Thompson Canyon. From that fork the trail begins a steady climb that takes it over a ridge into a different drainage. Once the trail drops over the ridge it follows this valley toward the Dolores River for right at 4 miles. At that point the trail begins climbing out of the valley up onto Beaver Mesa. It is apparent that the roads that the Kokopelli trail is following for this section are graded from time to time. That said there are still some rocky outcrops and rough spots. Any support vehicles should be medium to high clearance and preferably have 4-wheel drive to handle possible changing conditions and steep grades. After coming down Rose Garden Hill on the Dewey Bridge Section of the Kokopelli trail this is smooth sailing in comparison. Near the 10 mile point from where this section of the Kokopelli trail began it crosses from BLM land into the Manti-La Sal National Forest. A short distance later the La Sal Mountains begin to peak up over the horizon providing a good point of reference as to how the trail is progressing. At the 12 mile point the trail turns to the right as it reaches the Polar Mesa Road. The sign says that it is 11 miles to Fisher Valley, which is correct. We began this section 1 mile before the point that they are measuring to if you are wondering about the difference. The next 2.3 miles of the trail climbs around the head of Bull Canyon where you can see down into Fisher Valley all the way back to where this section of the Kokopelli trail began. Having a dust mask or handkerchief can come in handy if there is much traffic on the road for the next couple of miles. The road tops out at the Bull Canyon Dinosaur Tracks site where there is a restroom. The road surface has transitioned to pavement at this point as it begins a 5.5 mile descent toward Castle Valley. After losing almost 1,900 feet of elevation the Onion Creek Section of the Kokopelli trail comes to an end when it reaches the La Sal Loop Road. There are a good number of primitive campsites along the Onion Creek Section of the Kokopelli trail. The best ones are in the ponderosa pines along the Polar Mesa Road. The Rock Castle Campground is just up the road before reaching the La Sal Loop Road. It has an outdoor privy and a few picnic tables. There is usually water in Castle Creek but the campground is in a sagebrush flat that can be extremely hot during the summer months. Of course, the hot summer months aren't exactly the ideal time for doing the Kokopelli trail. If you would like to see it for yourself then all you have to do is grab your bike or 'Take a hike'.